While there are many Asana Premium features not all featured here, to make the most of your trial or get started quickly with Premium, there are a few key features you can get started with to see the value of Premium right away. We’ve outlined them below, showing you how to use them, examples, and quick videos that help you get started. See the list of all Premium features. Custom fields help you track more information on each task. With dropdown, numeric, or text fields you can capture details categorically and track progress, status, and more. You can also filter and sort projects and advanced searches by custom fields. Add custom fields to any project by clicking the blue Add Custom Fields link at the top of any project. From here you can create and manage your custom fields according to what information you need to track. Once added, the fields will show in List, Board, Calendar, and Timeline Views in the projects where you’ve added them. They will also show in the task descriptions. To update a field, just click on the dropdown or type into it from the task. Need to search for or report on specific data fields and values. Start dates show when you should begin your work to hit your deadlines without the last-minute scramble. They also help a project manager visualize a project’s overall schedule to plan when work should start and finish. Click on the date picker in any task and select Add start date then select the day you need to start work on it. Then move your cursor to the due date and you’ll have the full date range needed to complete the task. Visualize and easily shorten/lengthen task date ranges in Calendar or Timeline View. All tasks in projects like: event planning, campaigns, and product launches, to ensure you can hit your final deadline. Strategy tasks (e.g., giving feedback, researching, to give yourself enough time to think on them before your final answer is needed. Task dependencies make it clear which tasks are ready to start, and which tasks are waiting on others. That way, teammates get started on work at the right time and don’t have to keep checking in to see if something is ready or risk missing a handoff. Head to the task that is waiting on other work, then click task actions menu (three dots icon) from the right paneright pane The right pane holds the details of a task or Conversation. Read more and select Mark as Dependent On…. You can search for and select the task that will need to be completed first before you start on the current task. Add as many dependencies on other tasks as needed. Use Timeline View to easily draw dependencies between tasks and resolve any schedule conflicts if the tasks are all in the same project. Once your task is ready to start, you’ll receive a notification in My InboxMy Inbox My Inbox displays activity on tasks, projects, or conversations a user follows. Read more that you’re ready to get started. 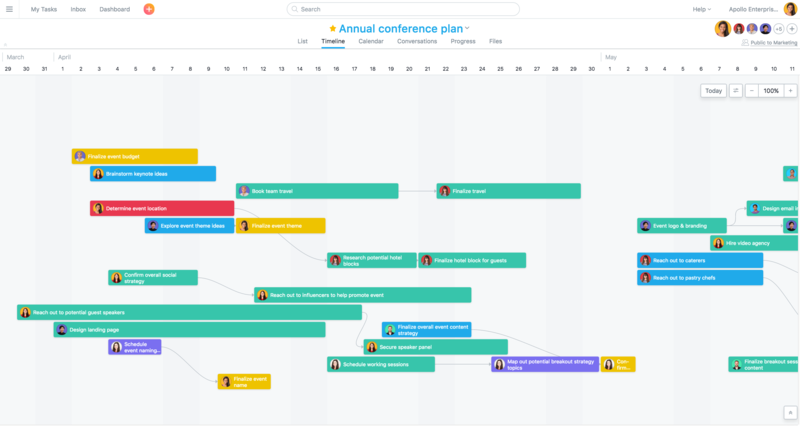 Timeline gives you a beautiful, living view to see how the pieces of your plan fit together and hit deadlines. It’s a more powerful Gantt chart because it’s tied to your underlying work in Asana so it always stays up to date. Timeline is a project view, so it’s visible for any Asana project. It works best as you begin to add start dates, due dates, and dependencies to the tasks in your project so you can visualize the schedule. Get started by clicking the Timeline tab just below the project’s name. You can drag and drop tasks on Timeline to create and adjust your plan. Timeline also updates as you make changes in list or board layout. Timeline works best with projects that are deadline-driven (versus ongoing.) 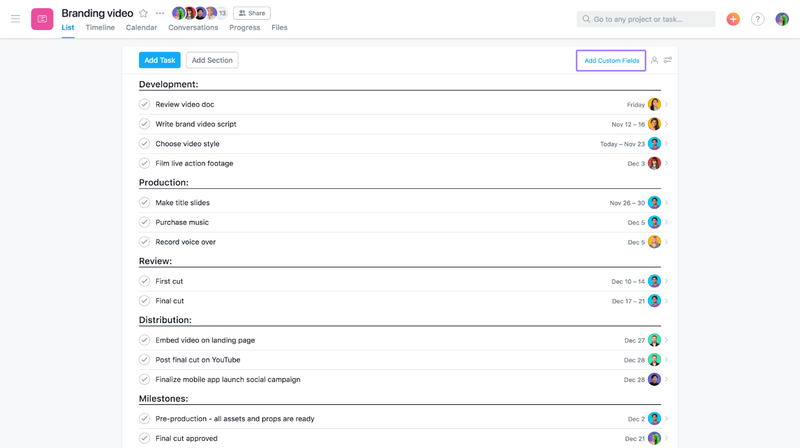 Click any of the use cases below to get the template in Asana, and get started in a few clicks. If your team has workflows they normally follow or processes they repeat often, you don’t need to recreate those tasks and projects in Asana every time. Whether you create your own custom template or use an Asana-created template, it’s easy to set up a workflow so you don’t have to start from scratch or miss any steps. Create a new project and add the appropriate tasks, sections or columns, and custom fields to organize and categorize your work clearly. You can assign tasks, include attachments, and task details to the template project in advance if they’re needed every time you complete this process. Once you’ve made the project template, click the project header dropdown, and select Save as a Template. Only the template creator will be able to modify the template to prevent accidental changes. You can add other editors if needed. Once you’re done using the project for current work, remove information that isn’t needed, such as due dates, assignees, and attachments. After your project is cleaned up, click the project header dropdown and select Save as a Template. To use your templates, create a new project by clicking the + button in the top bar. Click the Templates tab in the new project screen. Your custom templates will be organized by team. This is also where you can access templates created by Asana. After you find the template you want to use, and select Use Template to create a project using this template. After creating a new project from the template, you can further customize it. Advanced Search reports are especially helpful for project managers, team leads, and managers trying to get a quick, clear picture of bandwidth, progress, or work that’s at risk. To create a report, click inside the search bar, and select Advanced Search from the dropdown. From here, you can specify your search criteria and/or terms (keep in mind you don’t always need a search term). You can use as few or as many search filters as you’d like. Once you’re done searching, you can save your search by clicking the star in the header. That way, you’ll be able to access your report anytime from the sidebar. The search results are always automatically up to date. Checking bandwidth—Search for tasks assigned to a teammate due in the next week to quickly check their bandwidth. Work you need to follow up on—Search for tasks you’ve created for others that are incomplete. Tasks at risk—Search for tasks with a “high priority” custom field due today or tomorrow. Great for project managers to keep up a project’s momentum. Work I’ve completed this quarter—Search for tasks assigned to you that were completed in a specific date range. Great for anyone to see and prove their contributions. Project progress—Search for tasks completed in a certain project to see what’s been accomplished so far. 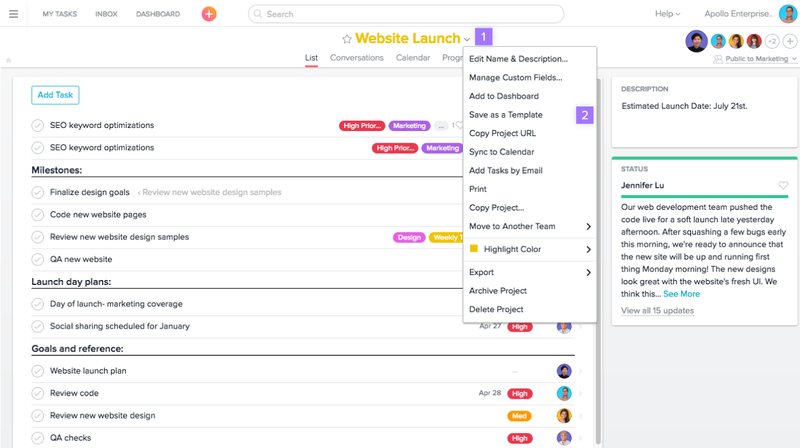 Overall, Asana is about making work transparent so there’s accountability and clarity. For more sensitive work, Premium customers can adjust project and team privacy settings to make sure that they’re only accessible to those that need it. With comment-only projects you can also control who is able to modify a project so no accidental changes get made, while still giving them access to it. The more information you put in Asana, the more you also need to be sure that the information is secure and your IT team has control over the data. As teammates come and go, or you add guests you can control their access to other teams and projects, or remove them entirely from your domain. If there’s a security breach, the admin can also force a password reset to keep your information in Asana safe. Now you’re up and running with the top Premium features so you can start building them into your workflows and see the benefits they bring to your work and team right away. You can always see the full list of Premium features and get more tips on the Guide. Explore other ways to expand your team’s use of Asana.